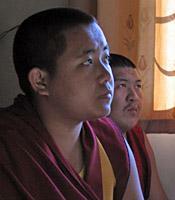 In 1991, filmmakers Ritu Sarin and Tenzing Sonam made The Reincarnation of Khensur Rinpoche, which followed the search of a Tibetan monk, named Choenzey, to find the reincarnation of his recently deceased master, Khensur Rinpoche, and documented Choenzey’s eventual discovery of a four-year-old boy recognized by the Dalai Lama to be the one. Without sentimentality, the film captured the moving relationship that developed between the erstwhile disciple and his young master. Sixteen years later, the directors revisit the reincarnation at Drepung Monastery in South India, where he has been brought up within the age-old traditions of Tibetan Buddhist monastic life. He is now 20 years old, and his devoted attendant, Choenzey, continues to take care of him. His spiritual teacher is Geshe Wangchen, one of the most respected masters in the monastery, who was himself a disciple of Khensur Rinpoche. The Thread of Karma offers an intimate look at the life of the young lama as he aspires to live up to the reputation of his former incarnation. It also explores his moving relationship with the two people closest to him, his attendant and his spiritual master, both of whom were connected to him in his previous life. By focusing on these ties that cut across lifetimes, the film paints a touching and insightful portrait of the Rinpoche even as it demystifies the Tibetan Buddhist tradition of reincarnation. The Thread of Karma will engage students and generate discussion in a variety of courses in Tibetan and Asian studies, Buddhist studies, cultural anthropology, and comparative religion. It was produced by Ritu Sarin and Tenzing Sonam for White Crane Productions.